The CI981 in an integrated 8 + 6kg washer dryer. This huge washing and drying load is perfect for large families and saves space by incorporation 2 appliances in one. With the amazing A energy rating you will be sure to save money on your household bills while getting the best possible performance. This washer dryer also comes with many handy features including a 15 minute quick wash if you are in a hurry and a delicate programme for those more fragile pieces that you want to protect. The ultimate in space saving ingenuity, an integrated washer dryer offers a full laundry package that can be installed behind a cupboard door, out of sight. Not everyone has got the room in their home for both a washing machine and a tumble dryer. That doesn’t mean that they should have to compromise on the convenience that they have available in their homes. Now, you can enjoy the best of both with an all-in-one solution to suit you. The CI925 has a 6kg wash and 3kg drying load capacity, which is more than ample for the average household. It features a delay timer so that you can load up your machine and clear up your living space without needing to start the wash cycle right away, or forgetting to for that matter. You can clear up and get tidy, pre-setting your appliance to wash either when you turn in for the night and tariffs are cheaper or exactly the right amount of time before you will be in and ready to unload the machine and put the items away. We’ve loaded it with 11 programmes to give you the choice of functions and features that best suit your washing requirements and with a 1200rpm spin speed, as well as variable spin and temperature control, you can accurately care for your laundry with every wash. In a hurry? This model also has a 15 minute quick wash for when you need something to wear, fast! Taking care of your appliance shouldn’t be a chore, that is why the CI925 features a handy drum cleaning programme for good maintenance. It is a condenser dryer too which means you will need to empty the reservoir regularly-not a problem with the easily removable container. For more information on the different spin speed settings, visit our guide to see what the numbers all mean and what setting is best for which type of laundry load. 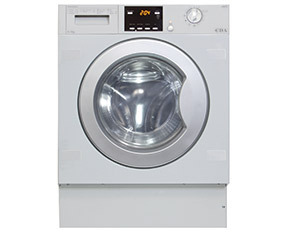 Our CI971 is larger in capacity, washing up to 7kg and drying 4kg. This makes it perfect for the larger family whose requirements are a little more demanding. As well as the adjustable temperature settings and 1400rpm spin speed, there are additional, helpful features like anti-crease, variable drying, total aquastop and anti-flooding safety included as standard to look after your clothes and especially your home, should anything go wrong. We’ve also included an LED display for ease of use and 15 programmes for intricate control over your washing and drying, with programmes for intensive cleans and delicates as well as flexible spin, dry and wash settings. Take a look at our capacity guide to find how much laundry space you need in your appliance to balance washing and drying requirements, versus economy with water, energy and money.